This charmingly furnished holiday apartment is located on the dike leading towards the beach. 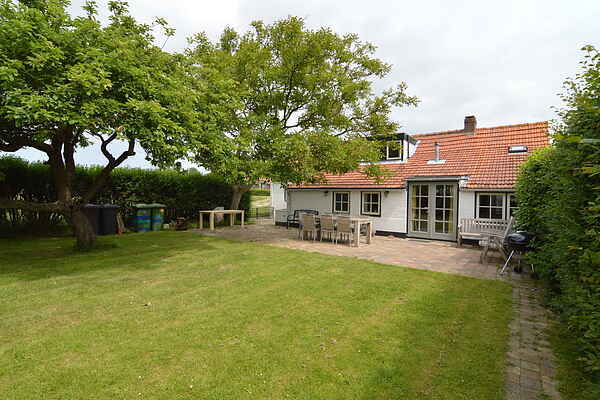 The accommodation is one of a kind, since there is a big, wonderful garden behind the house with a large lawn containing a trampoline, as well as a lovely terrace where you can barbecue in the summer with all your friends. Nieuwvliet beach is a quick walk away, just at the end of the street. After a lovely seaside stroll or a day of sunbathing, you can relax at the beach bar on the beach. On the dike you will also find a great playground with a restaurant and outdoor café where you can relax while the kids play to their hearts content. Not far from the holiday home is an equestrian centre, and from here you can go horseback riding on the beach or through the woods. But the area is also a perfect destination for some fantastic hiking and cycling. A day out in Sluis or even Bruges is certainly worth the trip. You will also find fabulous little towns on the Belgian coast with plenty to keep you entertained all day. For example, there are the villages of Damme and Lissewege, both worth a visit. And of course theres nothing like lounging at one of the charming little cafés in Cadzand or Breskens.